Osmosis skincare creates permanent change in the skin by using clinical ingredients with a holistic and noninflammatory approach. The brand was founded in 2007 by Dr Ben Johnson, a Colorado-based physician who also spends his time writing skincare books and speaking at medical forums across the U.S.
Omosis' patented, dermal delivery system takes nutrients deep into the skin to create great change without damaging the skin. The serums repair damaged DNA by speeding up the production of proteins and antioxidants, which rejuvenate skin cells from inside-out. Their formulas can also lighten hyper-pigmentation, reduce visible capillaries, and stimulate collagen production. It is free from toxic chemicals, SLS, phthalates, parabens, gluten, artificial colors and fragrances. All products are lightly scented by various herbs, fruits and essential oils. When possible, natural and bio-identical ingredients and have clean, non-toxic formulas are used. Osmosis' award winning colour line offers luxury performance makeup made from finely milled minerals. Their products are professional grade, long-wearing and full of intense natural color. Micronized zinc provides broad-spectrum coverage that naturally hides skin imperfections while providing flawless radiance and improving skin health. It is specially formulated to be bismuth-free so skin does not look chalky or dull. Packed with skin nourishing vitamins and minerals from natural sources. Osmosis makeup does not oxidize during the day. Nor does it accentuate pores, fine lines, or wrinkles. It stays on the skin throughout the entire day, unlike other natural mineral based make-up lines that need to be re-applied as the day goes on. The formulations and colors all accentuate the natural beauty of each individual with out the use of harsh chemicals. We offer the full professional MD line with all perks more potency brings. Schedule a personalized consult and experience Osmosis skincare for yourself! Schedule a 45 minute skin consultation to get your customized skincare plan. We offer targeted support for specific skin conditions and concerns. Leave with a plan and the Osmosis MD products you need to start repairing your skin. We offer color classes so you can see and experience all Osmosis Colour has to offer. Don't like to guess? Let us color match you so you get the right shade every time. 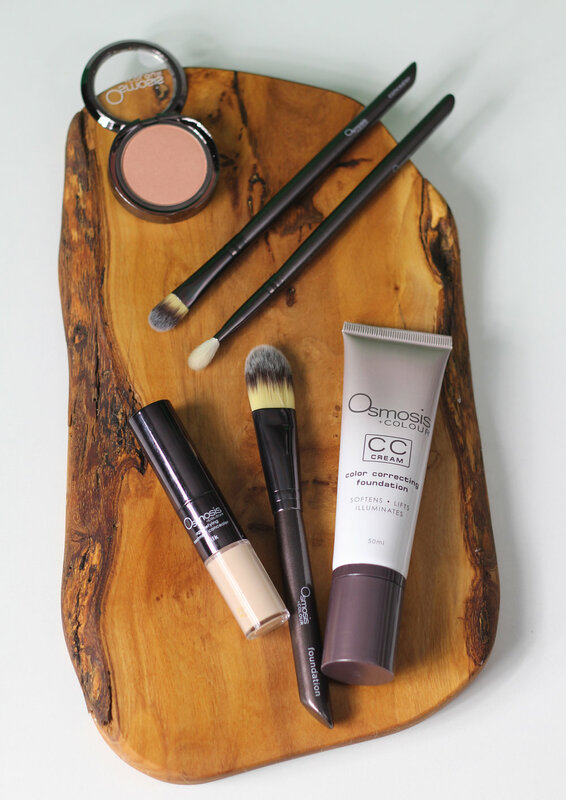 Whether Warm, Cool or Neutral, you will find the right shade for your skin.